Values matter. Not only for large companies, but especially for startups. Over the course of my time working for a VC, I’ve seen companies struggle with the absence of a proper value system more than with anything else. The dethronement of Uber and its battered image is a powerful example of what happens if you neglect building a proper corporate culture and pursue the wrong values. In the beginning of the life of a company every employee sits in the same room as you, the founder. You watch them and they watch you. There is clear transparency on values, even though they are not written down. Everyone sees how they are lived. If you grow from a small company with less than 10 employees into one with more than 50 or even more than 500 employees, the leadership team does not see every employee anymore. And you also don´t see how your team leaders are leading their employees. Do they still live up to your values? The issue becomes even more salient if you operate in different locations. Every company has a corporate culture. But it’s up to you to define its nature and check if it’s aligned with your company goals to double up on power and speed. You may have a good compass for your values and people watching you may understand them. But they might be missing a navigation system helping them to take decisions when you are not around. And in case a single team leader is not behaving according to these values, each and every one should have the right and even better the duty to remind him of these values. But that requires a shift from implicit to explicit values. You need to define them and make them binding. For instance, if your CTO is an excellent architect, but a lousy team leader, should you tolerate it because he is such a brilliant guy and you don’t want to let him go? No! You can’t tolerate it as it will destroy your culture. Every employee would observe that you are willing to compromise your principles if other benefits are given. Either you make him change or you redefine his role making him the chief architect without disciplinary responsibilities. If none of that works, you have to dismiss him. Defining your values takes time and doesn’t bring your company forward immediately, but missing this exercise will hinder your company to grow later on. There are many examples of company values available online the most prominent probably being Netflix‘s. You don’t need to reinvent the wheel, but you have to select the values that are relevant for your business. For instance, if you’re an airline, “no tolerance for failures” might be an adequate value. But for a startup it sure would slow down speed too much. You need to allow for mistakes, but repeating them needs sanctions. The set of values for your company is not as obvious as you might think. It takes time and thought to put them together. Don’t do it on your own. Build a team to discuss, shape and rephrase your values. In the beginning, it’s just the topics that you select. That’s rather easy. But then it’s the wording that best reflects your convictions. That’s the tough part, because it’s important that you and every employee can and will live up to these values. Think of potential tradeoffs. Does the wording clarify what will be the priority? Try to think of specific examples, e.g., will you really put the customers’ interest first all the time? Even beyond financial interests of the company? To give you an example, at an ecommerce company that I led, a pricing error occurred leading to a published price for a product listed of €98.90 instead of €989. Once we found out, there were already more than 500 orders in the system. So what did we do with these orders? We couldn’t afford accepting the error. We decided to tell the customers that we had to stick to the correct price but we were willing to offer each of them a voucher of €100 independent of whether they would buy the product or not. It was still an expensive decision, but we wanted to put the interest of the customer high and at the same time make sure that we would not ruin the company. Once the values are defined, the process isn’t over. Take the opportunity of a company meeting to introduce and explain them. Be willing to hang them up in every office all over the world and allow each employee to quote them. And if necessary, do amend them. Yes, you may amend your values over time. I learned about the importance of values early on when I was an intern at McKinsey. I attended a meeting and disagreed with the team’s conviction. The director asked me to speak up, which I did, and it changed the whole proposal. I was impressed. I learned that the argument is important, not the position of the person who brings it up. I also got the advice that next time I shall not wait to be asked but speak up directly. The director quoted one of our values: “Uphold the obligation to dissent.” I understood. It’s not a right, it’s an obligation. In my early days at a company that I founded, we had a database problem hindering us to serve our clients. Although we were well aware that informing our customers would cost us money due to our service level agreements we informed them right away. None of them had noticed the problem yet, but all of them were pleased that we told them right away. Setting the customer interests first paid off. Three out of 15 customers used the opportunity of us calling to buy additional tools from us in the following weeks. Disregarding values needs consequences. 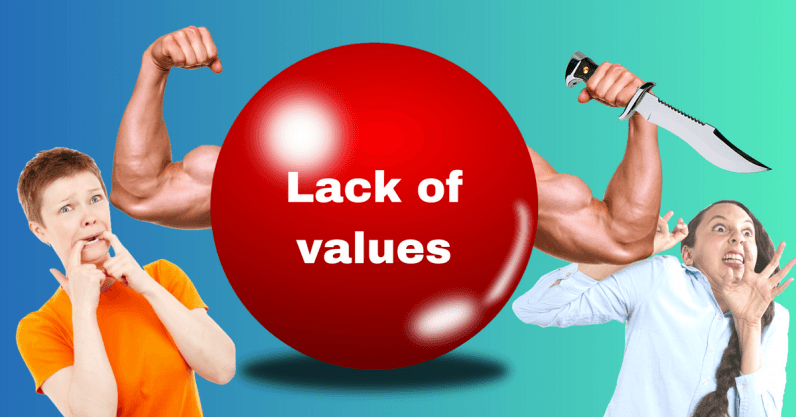 Rewarding employees that stick to these values and setting back or even firing the ones that don’t are clear signs that you take your principles serious. The way you behave is watched by all your employees. Therefore, do live up to your values. Always. In particular, in times of trouble. At sunshine, all of us easily live up to our values. But they count when you encounter tradeoffs. And then everyone is watching.